Fundsters, like everyone else, are still processing Donald Trump's Tuesday night victory. Here are some more reactions to the results of the 2016 U.S. presidential election. Bill Gross, the famous Janus [profile] bond fund PM, tells Bloomberg that Trump winning doesn't necessarily mean faster economic growth. 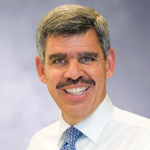 Mohamed El-Erian, chief economic adviser to Allianz [profile] (and former colleague of Gross), tells Bloomberg that "we're likely to see equity markets lower" if Trump keeps up his anti-trade talk. Yet El-Erian sees an opening for Trump to push a bipartisan, pro-growth agenda around infrastructure spending and regulatory and tax reform. Jeffrey Gundlach, CEO of DoubleLine [profile], tells Reuters that stocks are up, despite the initial selloff, because "U.S. investors think Trump is better for growth than Hillary, in the short-term." Gundlach also notes that Trump's "policies are not supportive of long-term interest rates." Ed Keon, PM at Prudential's [profile] QMA, predicts "large fiscal surge" of tax cuts and government spending and possibly higher inflation. Keon still predicts a Federal Reserve interest rate hike next month. On the flip side BlackRock [profile], Bloomberg reports, sees Trump's victory as pointing to the Fed not raising rates next month. Bashar Qasem, president and CEO of Azzad Asset Management, describes Trump's victory as "a shock wave through global markets", yet argues that strong economic indicators (new jobs in October, etc.) matter more than the short-term Trump shock. MainStay Investments [profile] (in an unsigned note) raises concerns about free trade "and existing diplomatic relationships" while echoing others' predictions re fiscal stimulus. MainStay also cautions that "chances are that one's investment goals and circumstances will not change materially as a result of the election." Manning & Napier [profile] (also in an unsigned note) urges investors to avoid "reading too much into the fact that Trump won" because fundamentals matter more. Karen Dunn Kelley, senior managing director of investments at Invesco [profile], points out that "it is by no means sure that [Trump] will be able to muster the support necessary to enact the sweeping reforms he has proposed." Wasif Latif, head of global multi-assets at USAA Investments [profile], sees "plenty of uncertainties" and challenges ahead, the biggest being "slow economic growth." Paul Schott Stevens, president and CEO of the ICI, congratulated Trump on the big win while reiterating the mutual fund industry trade group's policy priorities around regulation, retirement plans, and economic growth. The Financial Planning Coalition stated that they "will work with President-elect Trump" and reiterated their support for the DoL's controversial fiduciary regulation, a regulation that, per both a Trump advisor and the Consumer Federation of America, might be in jeopardy once Trump takes office. And Morningstar's John Rekenthaler uses election prediction woes as a lesson for building investing and financial planning models.